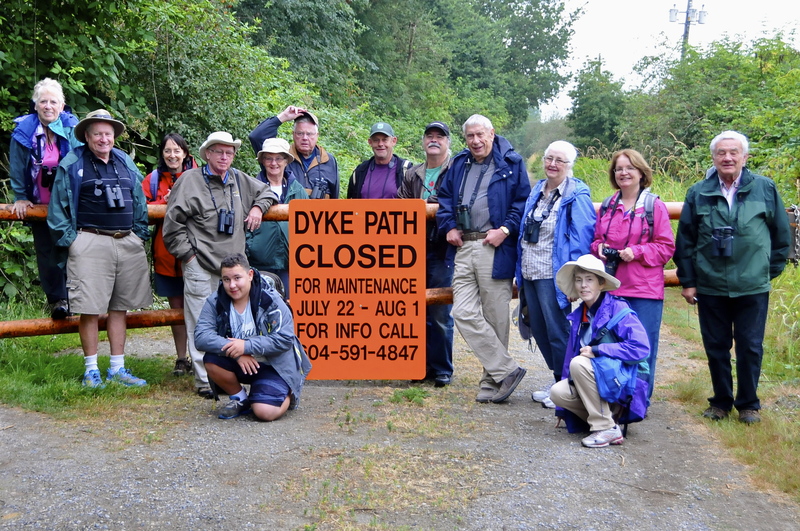 Sixteen hardy souls started out on rainy Wednesday morning at Serpentine Wildlife Management Area in Surrey and several of us finished the outing on White Rock pier. Check out the photo evidence of our almost-memorable outing on our DNCB Picasa website. Seven of us carpooled from Petra’s at 7:30 a.m. in two vehicles (Roger with Mike and Gerhard, Glen, Jane & Julian with me) and we got to the Serpentine parking lot by the Barn Owl barn right at the 8:00 a.m. scheduled time. We met Langley Anne at the entrance as she was searching in the trees for the resident Barn Owl that she had earlier scared out of the barn. Our first missed target bird. We met the other “less-vigilant” birders at the parking lot including our Leader White Rock Al, always-smiling Liz, patient Pauline, newbie Tom “One” and Aussie Nance. Anne & Ken wheeled in as we were doing our intros and the time-challenged, loquacious Otto arrived while we were on the trail. It was spitting a bit as we approached the park gate and the huge PARK CLOSED sign. As you all know, neither weather nor laws stop us DNCBers from pursuing our passion. So, following Ken taking the appropriate Group Photo, we sixteen squeezed around the gate and followed the path to the first Lookout. Lots of the regulars singing in the bushes (Spotted Towhees, Song, White-crowned and Savannah Sparrows, House Finches, colourful American Goldfinches, Bushtits, etc.) A Pacific-slope Flycatcher was a neat sighting that most saw. From the Lookout Tower three Long-billed Dowitchers were foraging along the edge of the first pond. Cedar Waxwings were everywhere. Further along the inland trail were Marsh Wrens, Common Yellowthroats and heavier rain. Two Hooded Mergansers and one lonely American Coot were among the families of Mallards in the big ponds. Lots of Tree and Barn Swallows hawking bugs around us. We also identified a Violet-green but couldn’t confirm other Swallow species. When we reached the Serpentine River, although the rain had lightened, several soaked wimps bailed on us. The less-frail eleven continued along the river to the second Lookout. Newbie Dutch Tom “One” spotted a Spotted Sandpiper bobbing on the rocky shore. Then two unusual gulls stretched our birding skills, but with the help of Julian’s Guide, we eventually confirmed them as just immature Ring-billed Gulls. Of course there were easily-IDed adult Ring-billed around with Glaucous-winged Gulls. From the second Lookout Tower the screeching Falcon we heard tuned out to be a fabricated sound from the blueberry field across the river. As we wandered down river, the tide was still low showing the remnants of the old Oyster Farm bed. The most interesting sighting was the huge, gas-guzzling excavating machine with its arm awkwardly weaving back and forth somehow trying to mow the grass on the side of the path. Seemed terribly inefficient to me, but…. As for birds, from the third Lookout Tower, the only new sighting was a Northern Shoveler. We were blanked on Rails and all three species of Teal. Back at the parking lot, being only 10:30 a.m., the lingering ten decided to check out White Rock and the resident Willet. The drive to White Rock was especially memorable because of the delicious “food bar” along with tasty fresh strawberries, raspberries and grapes that Jane brought (We still need you PB Lorna). Refreshed and excited, we wandered down to the “white rock”, where the Willet was waiting for us. A few Killdeer were also foraging along the shore near the hordes of Canada Geese. Another shorebird, probably a Western Sandpiper was also feeding on the snot in the mud near the pier. We walked to the end of the pier where a female Belted Kingfisher and a Great Blue Heron posed graciously together for their photo shoot. A Caspian Tern gave a fly past. Our new, self-proclaimed Gull expert Roger identified a Mew Gull among the Ring-billed and Glaucous-winged Gulls. Although the off-and-on spitting rain continued on the ride home, we all agreed that it was nonetheless a very enjoyable morning. This entry was posted in *DNCB, Barn Owl, Long-billed Dowitcher, Serpentine Fen, Spotted Sandpiper. Bookmark the permalink.